Ever since we heard about the first flexible displays, rumours, leaks and patent applications have pointed to folding devices on the way. However, the device makers have only thus far used so-called flexible displays for slightly rounded screen edges or slight device curves - nothing actively, mechanically flexible. That will hopefully change in 2019 when the Samsung Galaxy 'Winner' device is revealed. Mid-week the Wall Street Journal reported upon the foldable Samsung Galaxy smartphone. The standout feature of this device will be the foldable 7-inch diagonal OLED screen, making it the first true 'smablet'. It will fold like a wallet with a smaller display and cameras on its outer lip, sources told the WSJ. 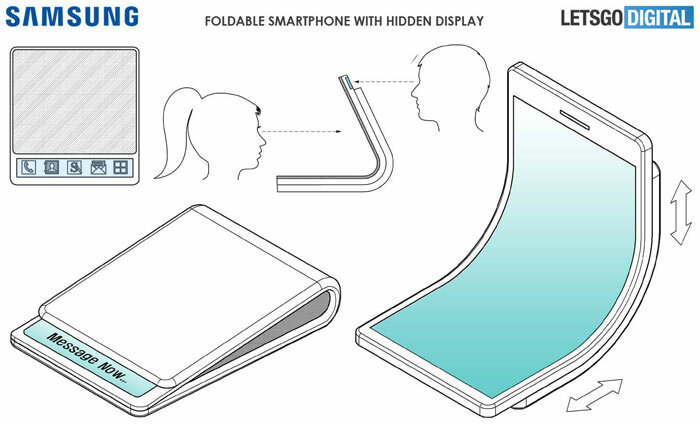 Samsung may be the first to utilise this folding form factor without having a split screen. Yesterday the plot thickened, as Dutch site Letsgodigital unearthed a July 2018 international patent for a Samsung device almost identical to that described to the WSJ on Wednesday. VentureBeat says this patent, dubbed 'Foldable Smartphone with Hidden Display' was filed in 0216 and approved in 2017. You can see the published patent images above and below. Current generation slab-style smartphones are getting closer to 7-inch diagonals thanks to manufacturers and technologists working to remove bezel necessities and functions. VB reports that by September Apple will release a 6.5-inch iPhone X sequel with an overall size compatible to the current gen iPhone 8 Plus. A snag for early adopters of the Samsung wallet-style smartphones will be the wallet-emptying price, according to various sources. Due to the use of advanced materials, not just in the screen, pricing for the debut 'Winner' device could be as high as $1,500.